Rabbits are like potato chips; you simply can't have just one. No, really. Quit laughing. LOL. Come back after raising rabbits for a year and read this again, you will no longer be laughing I guarantee it. ;) The very first major decision you have to make after deciding to raise rabbits is, what kind of rabbits do you want to raise? First decide why you want to raise rabbits. Do you want pets? Pelts or wool? Meat? Some breeds are better for each use than others and some breeds are dual or triple purpose. It’s important to learn about the different breeds and their ideal uses. Know what breed or breeds will fit your criteria. Some breeds can cover all the criteria in one shot, while some are better at some aspects than others. Do your research ahead of time to make sure that the breed you are looking to buy will be a good fit for you. There are 49 distinct rabbit breeds recognized by ARBA, and then of course there are crosses and hybrids and unrecognized breeds, making for a LOT of choices. Recognized rabbit breeds are classified by color and pattern (variety), body type/shape, weight, and fur type (fur, wool and hair). Make a list of the qualities you want in your rabbits. Find out the pros and cons of the different breeds, and then make an educated decision. If you are only interested in meat, then choose a breed based on meat production only. If you are interested in fancy pelts, fur textures or special colors then choose a breed that fulfills those desires. Enjoy the experience of raising rabbits. Even if you are choosing to raise rabbits for meat, if diversity is more important than maximizing feed to meat ratios then find the breeds you'll enjoy. In the end, you should select a breed that you want to become an expert in. You should love that breed. Your first priority should be based on not litter size or growth rate or meat to bone ratio, but on what you like in a breed. That way when things get tough- because they will, it’s inevitable- you will have that passion to help carry you through. Be careful when you are purchasing rabbits. Some breeds sound very similar but are completely different from each other. Mini Rex and Rex may share a pelt type but that’s where the similarities end. Mini Rex are pet and hobby rabbits and don’t make very good meat rabbits. Rex (sometimes incorrectly referred to as Standard Rex) is a meat and pelt breed and is a much larger breed than Mini Rex. There are five general body types in rabbits with variations within these types. All domestic rabbit fall into one of these five types. Full-Arch: These rabbits stand at alert and on their toes, and you can see under their abdomens. Some common Full-Arch breeds are Belgian Hare, Britannia Petite, Rhinelander, English Spot and Checkered Giant. Semi-Arched: These rabbits have a mandolin-shaped curve along their backs. Their head and shoulders press against the table and their loin rises gracefully to a peak at the hindquarters before the top line falls to the tail. Some common semi-arched breeds are American, Beveren, English Lops, and Flemish Giants. 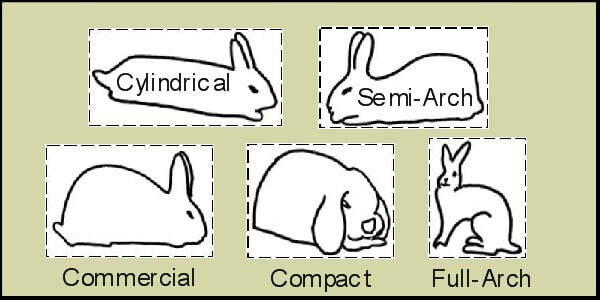 Compact: These rabbits can be small or medium sized. They are tightly constructed, giving a sense of roundness. They are shorter in body length than commercial rabbits. Some common compact breeds are Dutch, Mini Lop, Mini Rex, Florida White, Netherland Dwarf and Polish. Commercial: These rabbits are usually the best choices for meat production. They are well-muscled and of medium length, with depth of body equaling width of body throughout. Some common commercial breeds are New Zealand, Californian, Champagne d’Argent, Rex and Silver Fox. Cylindrical: There is only one cylindrical breed: the Himalayan. These rabbits are round and long with no obvious rise to the hindquarters. Be cautious when crossing breeds. For one thing, if you intend to sell your kits down the roads, you will get more for purebreds then you will for mutts. If your goal is just to raise rabbits for meat, then crossing commercial breeds is acceptable for backyard meat production. If you plan to cross breeds together, or to buy a crossbred rabbit, research the breeds so that you can know what to expect. Understanding the quirks of each breed can help you calculate what you might be able to expect from a crossbred rabbit. Personally, I’m always going to recommend that unless you are breeding for meat (and honestly, even if you are breeding for meat), always stick with purebreds. Each breed has different things that make it special, and crossing in other breeds dilutes or destroys those special qualities. Lionheads, for example, are famous for their manes. Rex are famous for their dense, velvety pelts. Flemish Giants are famous for their size and their dog-like personalities. Crossing other breeds into any of one of these can cancel out those wonderful traits. • American (9-12 lbs): Semi-Arch. Distinctive Trait: Old American meat breed; breed has been identified as critically endangered. • American Fuzzy Lop (3 ½ - 3 ¾ lbs): Compact. Distinctive Trait: A lop-eared rabbit resembling the Mini Lop, but smaller, and with wool that is at least 2 inches long. • American Sable (7 – 10 lbs): Commercial. Distinctive Trait: Color. • Angora – English (5 - 7 ½ lbs): Compact. Distinctive Trait: Its fine soft wool up to 5+ inches long. All areas of rabbit covered in wool, except for the immediate face. • Angora – French (7 ½ - 10 ½ lbs): Commercial. Distinctive Trait: Wool is 3.5 - 4.5 inches long. Head and ears are not wooled. • Angora – Giant (9 ½ + lbs): Commercial. Distinctive Trait: Giant size, wooled, ears tasseled with wool. • Angora – Satin (6 ½ - 9 ½ lbs): Commercial. Distinctive Trait: Wool is fine, soft and silky, carrying the sheen of a satinized wool shaft. Sheen is evident over the entire body, including head and ears, which are not heavily wooled. • Argente Brun (7 – 10 lbs): Commercial. Distinctive Trait: Color. • Belgian Hare (6 - 9 ½ lbs): Full-Arch. Distinctive Trait: Arched and racy, hare-like in appearance. • Beveren (8 – 12 lbs): Semi-Arch. Distinctive Trait: Its mandolin shape on a large body suitable for meat production. • Blanc de Hotot (8 – 11 lbs): Commercial. Distinctive Trait: Eye markings. • Britannia Petite (Max 2 ½ lbs): Full-Arch. Distinctive Trait: Tiny arched body. • Californian (8 - 10 ½ lbs): Commercial. Distinctive Trait: Himalayan markings in a commercial rabbit. • Champagne D'Argent (9 – 12 lbs): Commercial. Distinctive Trait: Color. • Checkered Giant (11 – 12 lbs): Full-Arch. Distinctive Trait: Large size, body type and spots. • Chinchilla – American (9 – 12 lbs): Commercial. Distinctive Trait: Color resembling the chinchilla and size. This breed is recognized as critically endangered. • Chinchilla – Giant (12 – 16 lbs): Commercial. Distinctive Trait: Color resembling the chinchilla and size. • Chinchilla – Standard (5 - 7 ½ lbs): Compact. Distinctive Trait: Color resembling the chinchilla and smaller size. • Cinnamon (8 ½ - 11 lbs): Commercial. Distinctive Trait: Color. • Crème D’Argent (8 – 11 lbs): Commercial. Distinctive Trait: Color. • Dutch (3 ½ - 5 ½ lbs): Compact. Distinctive Trait: Marking pattern. • Dwarf Hotot (Max 3 lbs): Compact. Distinctive Trait: Eye bands and dwarf size. • English Spot (5 – 8 lbs): Full-Arch. Distinctive Trait: Carriage and markings. • Flemish Giant (13+ lbs): Semi-Arch. Distinctive Trait: Giant but balanced size. • Florida White (4 – 6 lbs): Compact. Distinctive Trait: Commercial rabbit in a smaller size. • Harlequin (6 ½ - 9 ½ lbs): Commercial. Distinctive Trait: Alternating markings. • Havana (4 ½ - 6 ½ lbs): Compact. Distinctive Trait: Medium-small, vibrantly colored. • Himalayan (2 ½ - 4 ½ lbs): Cylindrical. Distinctive Trait: Cylindrical shape. • Holland Lop (Max 4 lbs): Compact. Distinctive Trait: Small size and lopped ears. Posed with head high. • Jersey Wooly (Max 3 ½ lbs): Compact. Distinctive Trait: Petite size and 3 inch wool. • Lilac (5 ½ - 7 ½ lbs): Compact. Distinctive Trait: Color. • Lionhead (Max 3 ¾ lbs): Compact. Distinctive Trait: Pattern of long wool around neck. • Lop – English (9+ lbs): Semi-Arch. Distinctive Trait: Enormous lopped ears. • Lop – French (10 ½+ lbs): Commercial. Distinctive Trait: Massive size, lopped ears. • Mini Lop (4 ½ - 6 ½ lbs): Compact. Distinctive Trait: Lopped ears, compact yet massive in effect. • Mini Rex (3 - 4 ½ lbs): Compact. Distinctive Trait: Rex fur on petite body. • Mini Satin (3 ¼ - 4 ¾ lbs): Compact. Distinctive Trait: Satin fur. • Netherland Dwarf (Max 2 ½ lbs): Compact. Distinctive Trait: Tiny round size, short ears, many color varieties. • New Zealand (9 – 12 lbs): Commercial. Distinctive Trait: Commercial meat rabbit. • Palomino (8 – 11 lbs): Commercial. Distinctive Trait: Color. • Rex (7 ½ - 10 ½ lbs): Commercial. Distinctive Trait: Rex fur. • Rhinelander (6 ½ - 10 lbs): Full-Arch. Distinctive Trait: Tri coloration, markings. • Satin (8 ½ - 11 lbs): Commercial. Distinctive Trait: Satinized hair shafts - finer diameter and a more transparent hair shell resulting in brilliant colors and enhanced sheen. • Silver (4 – 7 lbs): Semi-Arch. Distinctive Trait: Even silvering over entire rabbit due to silver-white hairs and hair-tips; considered a ‘rare’ breed. • Silver Fox (9 – 12 lbs): Commercial. Distinctive Trait: Long, evenly silvered fur, and is a meat breed. Silver Fox breed is recognized as critically endangered. • Silver Marten (6 - 9 ½ lbs): Commercial. Distinctive Trait: Black and silver coloration, long silvery guard hairs evenly distributed up sides of rabbit. • Tan (4 – 6 lbs): Full-Arch. Distinctive Trait: Rich fiery tan and lustrous top colors. • Thrianta (4-6 lbs): Compact. Distinctive Trait: Amazing, fiery red color.